Is your car starting to wander? Is the steering wheel pulling right or left? You just can’t keep it straight anymore? It might be time for a wheel alignment at Elkhart Mechanics. All sorts of things can contribute to uneven tire wear or steering wheel pull. Your tie rods could be worn, ball joints failing or something as simple as uneven tire pressure. But if you don’t keep on top of these things they could lead to part failure and possible accidents. Which of course could be really bad, to you, your car and your family? Wheel alignments don’t take long and don’t cost much. And they will save you thousands in tire cost and damage. So get to Elkhart Mechanics now and schedule your wheel alignment. All cars are made with their wheels at a certain angle, which varies somewhat from one car to the next. Normal use of the car can cause the wheels to deviate from their ideal angle of alignment, but mechanics can realign them. 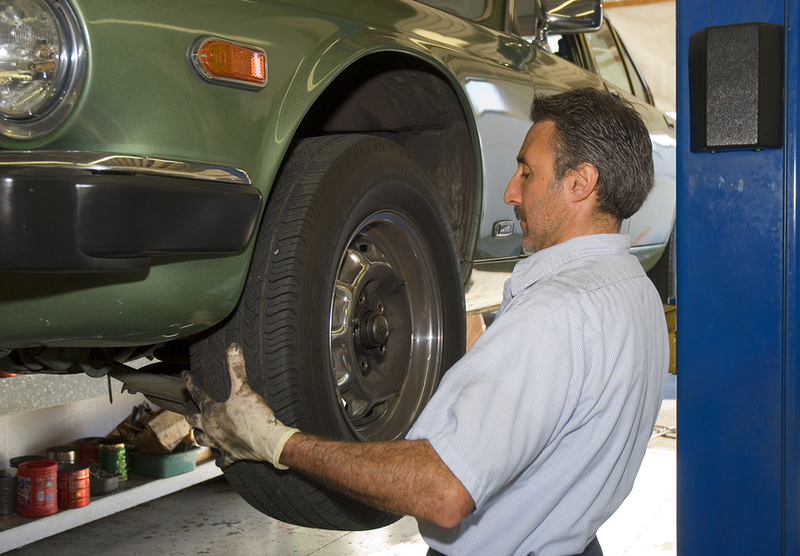 Improperly aligned wheels can lead to excess wear on the tires, and it can also cause problems with the suspension. Wheel alignment is also sometimes called breaking or tracking. Unless you drive on very rough terrain, you do not need to have your wheels aligned very often, but some car manufacturers recommend doing a wheel alignment every time you get a new set of tires. If your car feels like it pulls to one side without you turning the steering wheel in that direction, it may mean that your wheels need to be aligned. A squealing noise during turns can also be a sign that you need a wheel alignment. Aligning your wheels means adjusting three major angles for the front wheels and two for the rear wheels. The caster is the angle between an imaginary vertical line and the imaginary line between the upper and lower ball joints, and it is found only in the front wheels in vehicles with front-wheel drive. The camber is the angle between an imaginary vertical line and the vertical axis of the wheel; it is found on all four wheels. The toe angle is the angle at which the wheels turn inward when the car is moving, relative to their position when the car is not moving. It is also applicable to all four wheels. For most cars, wheel alignment takes less that one hour, but it may take longer for SUVs and other vehicles. Your neighbors at Elkhart Mechanics will align your car’s wheels efficiently and for a fair price.